Mohamed Salah had the two best openings for Liverpool before the break but his soft 15th minute shot barely troubled Jordan Pickford and then the Everton keeper was swift off his line to foil the Egyptian as he raced goalwards. 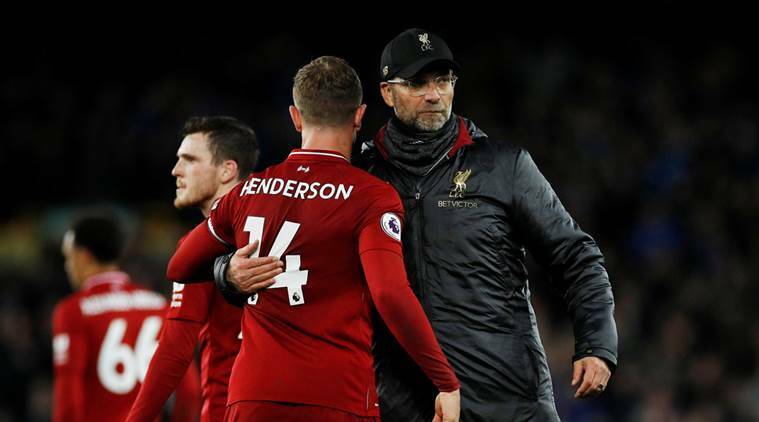 Liverpool were left a point behind Premier League leaders Manchester City after they were held to a 0-0 draw by Everton in Sunday’s Merseyside derby. City, who beat Bournemouth 1-0 on Saturday, have 71 points while Juergen Klopp’s Liverpool have 70 after their fourth draw in their last six games. Both sides have nine matches left. Everton’s approach was to harry and disrupt Liverpool and they did that task well but struggled to create opportunities with Theo Walcott unable to capitalise on a rare opening, screwing his shot wide. Salah threatened again in the 57th minute as he bore down on Pickford but Everton defender Michael Keane stopped a near certain goal with a perfectly timed last-ditch sliding tackle. Klopp threw on Roberto Firmino in the 63rd but the striker was unable to open up an Everton defence that raised their game to deal a blow to their local rivals’ title hopes.